NOTE: Although if I add this shortcuts under all applications then it works. I don't know why it's not working, wasted my time and I found on apple discussion forum that in Languages there should be only one language and that doesn't work for me. I have reported this bug to apple and it's still not being closed. I will update my answer once it's closed. Till then you can add this shortcuts under all applications(instead of preview) then it will work. I don't know why this isn't working either, but I ran into it with Mavericks too. I've tried both "…" (proper ellipses) and "..." (three .) and neither of them work. The key here is that the "Group" (labeled "1") is set up to only be active in Preview.app. Then the macro (labeled 2) is where we explain what we want to have happen. You can download my Keyboard Maestro macro here. 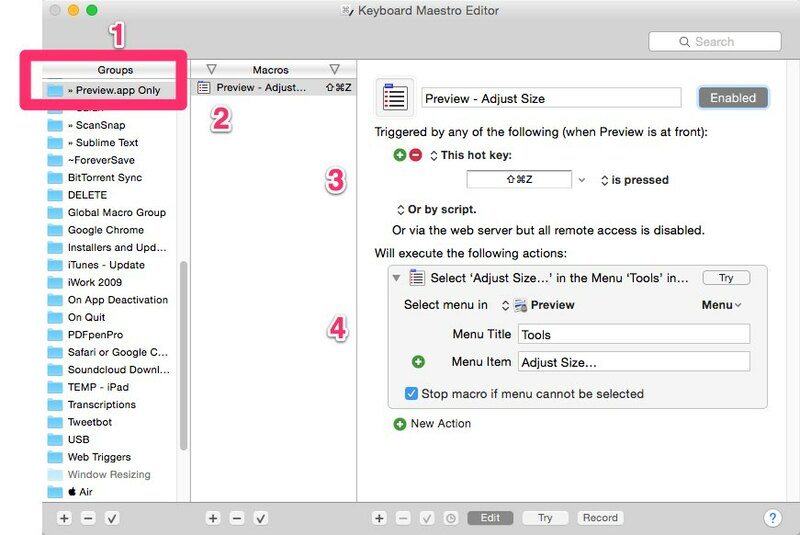 Unzip it, double click on it to import it into Keyboard Maestro, and it will create the "Preview only" group and add the macro to it. I still don't know why the official Keyboard Shortcut doesn't work in Preview.app, but an added bonus of using Keyboard Maestro is that since it can sync (using iCloud Drive or Dropbox), you can have it on all of your Macs. Keyboard Shortcuts added to the OS X System Preferences don't sync. Yet another reason I like Keyboard Maestro. I had a shortcut in Mavericks (option+T) to bring up the Tags box in Finder. Yosemite killed it, whether All Applications or Finder. Apple Support could not solve it, however I discovered that it will work if set to control+T instead. If using keyboard with number pad use the numbers on the top not the number pad. Don't know why it is different but it works for me using the numbers on top. Not the answer you're looking for? 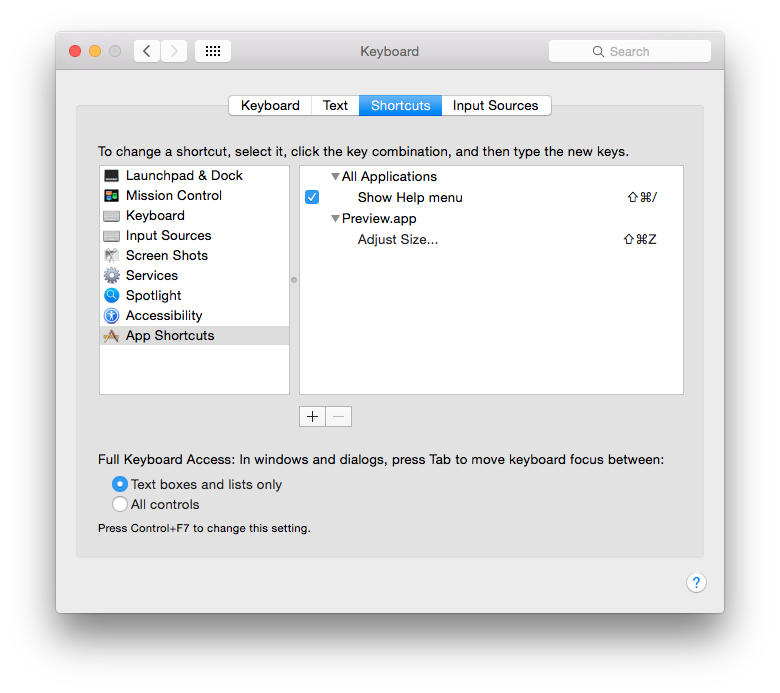 Browse other questions tagged macos keyboard yosemite system-prefs shortcut .